The perfect “manly” burger bun. 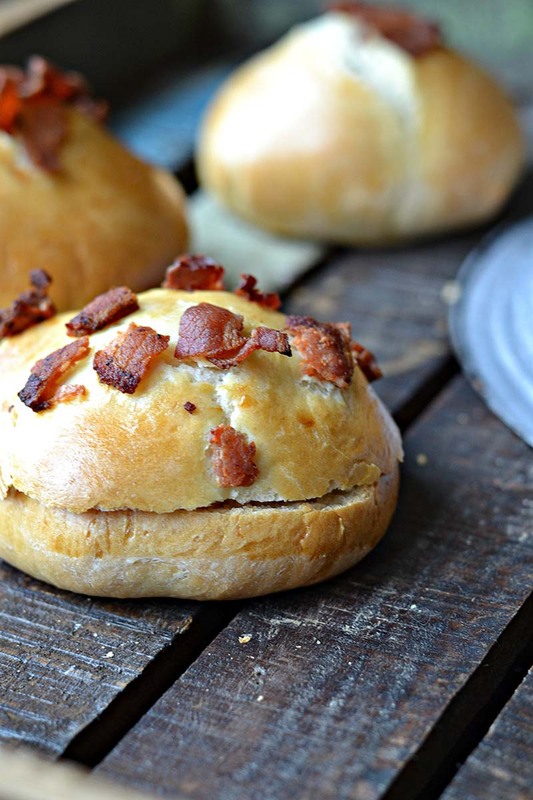 Filled with stout, and lots of bacon flavor. In a medium sauce pan over low heat, add bacon fat (or butter) with milk, beer, sugar and salt. Bring to a low boil. Remove from heat and allow to cool to 120-130°F. In the bowl of your electric mixer add half of your flour with the yeast, and your warm wet ingredients from previous step. With dough hook, mix on low speed until it starts to come together. Slowly add in enough of the remaining flour, ¼ cup at a time, until dough has come together without being too sticky. Turn mixer to medium/low for 6 minutes. (Or knead by hand for 8 minutes.) Dough should be smooth and elastic when finished. Turn dough into an oiled bowl. Cover with a dish towel and set in a warm place to rise until it has doubled in size, about one hour. Punch down dough and turn out onto a lightly floured surface. Divide dough into 12 equal pieces. Shape into rolls. Set on parchment paper-lined cookie sheets. Allow to rise until doubled in size, about 30-45 minutes. Preheat oven to at 400°F. Brush each bun with egg wash, sprinkle with bacon bits. Bake for 15 minutes, or until golden brown. Recipe created by Baked New England. Made these twice – awesome! Great with grilled burgers (especially if they are stuffed with bleu cheese). Anything with barbecue sauce tends to overshadow the taste of the bun. Freeze well. On to the onion mustard buns. Going to try. Will let you know if they are as good as B&B buns.